Synopsis: An upgrade you can feel! Sprint Booster for MINI Cooper is a plug-n-play performance upgrade for your Model Year 2002 or later MINI. This is an upgrade that you can feel with normal everyday driving, not just on the track at redline like most other performance upgrades! This works for all MINI's produced in or after 2002 models (specific to the automatic or manual transmission). Most cars in the 21st century have replaced the more conventional throttle cable for an ECM (Electronic Control Module) that translates how hard the pedal is pushed into electronic signals in order to provide power to the wheels. The ETC (Electronic Throttle Control), which is also known as Drive-By-Wire, has the unfortunate downside of delayed response and subdued acceleration, which can create problems in certain situations such as up-hill starts, quick gear changes and overtaking. Sprint-Booster overcomes this throttle response delay for your MINI by providing crisp, on-tap acceleration for whenever the driver demands it. Get more from your MINI - fit a Sprint Booster today! * The delay time whilst accelerating in 3rd and 4th gear and the engine in the mid-range, is almost zero. 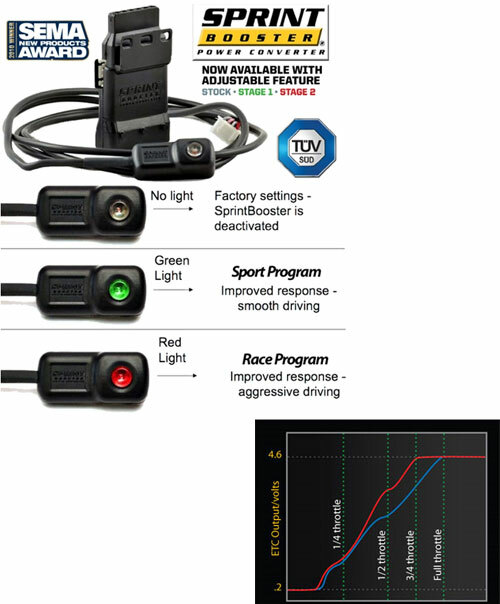 * Improved response for downshifts and safer overtaking. * Overall safety and more fun on the road! Sprint-Booster is a device that improves acceleration by continuously measuring and converting the digital signal provided by the ETC (Electronic Throttle Control) potentiometer and providing the ECM (Electronic Control Module) with a new, faster and more responsive signal. 1. Loosen the accelerator pedal module from the floorboard. 2. Unplug the harness from the accelerator module. 3. Plug in the Sprint Booster inline with the harness and accelerator module. 4. Re-install the accelerator module.